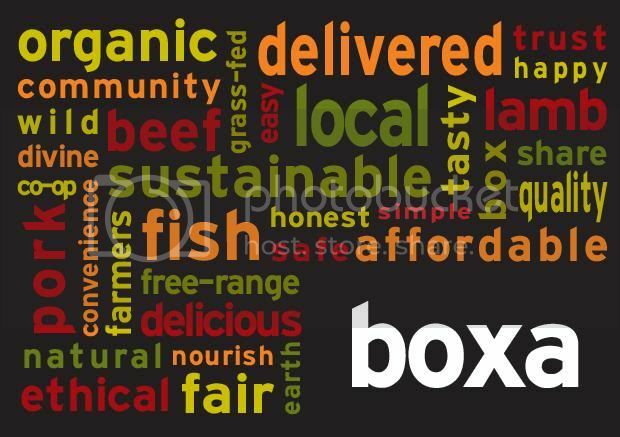 Boxa – possibly the best way to buy your meat! i can tell you ill try harder – i can tell you the new year will mark a new me – but i cant promise that…..
Now Rita has 65 regular buyers, and an additional 20 casual purchasers, sharing 14 cows, 40 lambs, 8 pigs, 25 turkeys, 65 boxes of fish (that’s nearly half a ton of fish) plus plenty of spuds and honey! 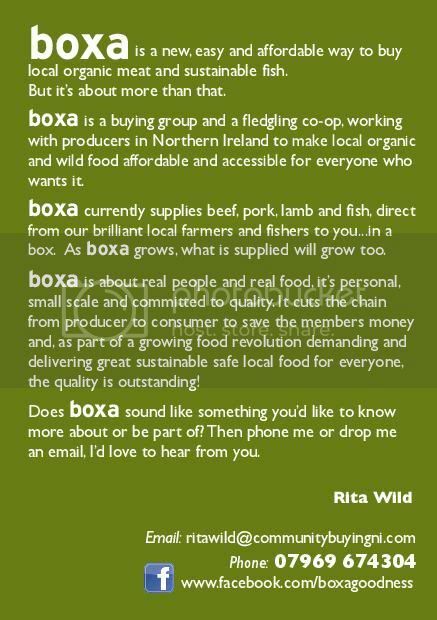 My favourite bit of this ( apart from how great the product is ) is the £20,000 she has been given to the farmers involved. Rita puts why this is so fabulous perfectly! You know what – it makes me smile a lot too – it is the way things should be! 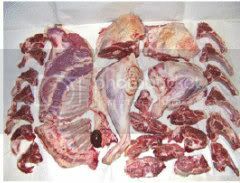 so fabulous in fact that – that i have since ordered myself – and have been spending the past month very merrily working my way through an incredible box containing 1/2 a lamb – and a box of very lovely fish. Which i must add surpassed my expectations, as i didnt expect it to defrost just as perfectly as it does – perfect! I would be really interested to know what Sainsburys ( or any supermarket for that matter ) make mark up wise on meat products – as the feedback I have been hearing from Rita is that we ( the community ) are giving them a far better price – but i am confused by this – as we are also getting the product at a lower price….. interesting…..
oh & did i forget to mention Rita visits every farm herself – just because a farm is organic doesnt mean it meats her high standards – the welfare aspect of the product is also hugely important – these are HAPPY animals – their farmers dont only care about the money at the end of the tunnel – people who genuinely care about the life before them – & of course this is turn is reflected in the high quality of the produce! a brilliant example of this is found in the way Michael and Cathy Black’s early lambs have been looked after this year! 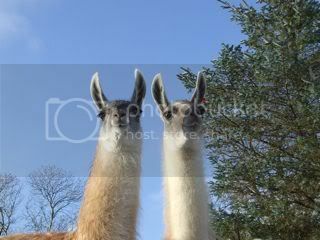 Having lost around 20 lambs to foxes most years – they needed a solution that would not affect the lives of the little lamb folk – and this was found in the form of baby sitting Llamas! They have not lost a lamb since – and they still get to be born outdoors in the beautiful Glens of Antrim!